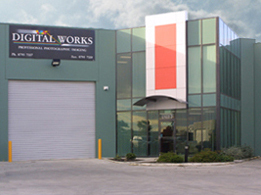 Digital Works is a professional printing laboratory specializing in high-speed digital print output. Digital Works was formed in 1987 by Graeme and Virginia Glasson who met in Pacific film laboratories Clayton, Victoria. Graeme started his career in 1971 with a small film process lab in Bayswater Victoria called "Film Pro" where he was trained in printing and printer control. When that company collaped he joined Phototechna film labs in Richmond and soon was in control of the B&W film processing department. This lab was later taken over by Pacific who then moved into new premises in Clayton by buying out Chromacolour. Here Graeme was in charge of film process of E6, C41 and B&W and chemistry . With Pacifics demise Graeme joined a professional printing lab called WL (Warshall Lastman) colour labs and was again in charge of E6 and C41 film processing department. WL colourlabs became insolvent and Nulab was formed. Graeme designed the lab layout and soon became assisant lab manager at Nulab when he and Virginia started their family owned business in 1987, "Sprintz Photographics and Photography studio" where they built a successful wedding and portrait photography and printing service lab. They soon found they had more professional clients than the lab could handle so moved to larger premises and at the same time took over All Hart pro lab. When digital printing became the norm Sprintz photographics became "Digital Works" in 2003 where they invested in new purpose built premises and new state of the art digital printing equipment. Graeme and Virginia continue to offer the highest quality online printing standard and services available. The owners and staff of Digital Works they constantly looking for improvements, new proven technology, equipment and papers as they become available in their quest for perfection. Digital Works prints using Archive Quality Kodak Professional papers, in Gloss, Lustre (Matte) and Metallic to 24 " (60.9cm) Width. Large format prints are produced on our fully profiled 12 colour, dual printer head, Image Prograph printer. Digital Works uses state of the art high speed photographic printers which prints sizes from 2.5x3.5" (7x9 cm) right up to 15 foot (5mtrs) long panel prints. All service times relates to images which are fully downloaded or delivered prior to 12 noon ES(D)T business days only and *work load permitting. Orders received after 12noon will fall into the next days schedule. Specials and promotions are not treated as priority and may incur extra delays due to higher volumes. Express Post couriers pick-up from Digital Works on day of completion. Fastway couriers pick-up from Digital Works on the next business day of completion date. An automated email will confirm completion of Online orders.